Frontalis suspension is often reserved for cases of congenital ptosis with poor levator function and progressive myogenic ptosis in the adult. Various procedures have been proposed throughout the years to attain optimal function and cosmesis. In addition, various materials for the suspension material have been promulgated. 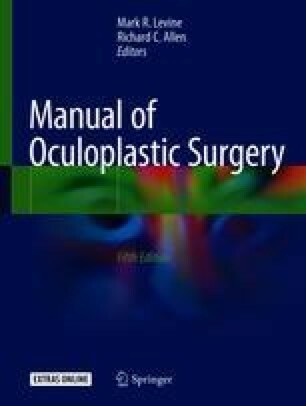 The purpose of this chapter is to describe the preferred procedures and materials of the authors for poor levator function congenital ptosis and progressive myogenic ptosis in the adult. The online version of this article ( https://doi.org/10.1007/978-3-319-74512-1_18) contains supplementary material, which is available to authorized users. The authors have no funding, financial relationships, or conflicts of interest to disclose. All subjects involved in the study cited in Part I gave informed consent for the treatment described.